What is your role at Adido? Everything to do with social media. Helping brands find their social media superpowers! What do you enjoy most about working at Adido? 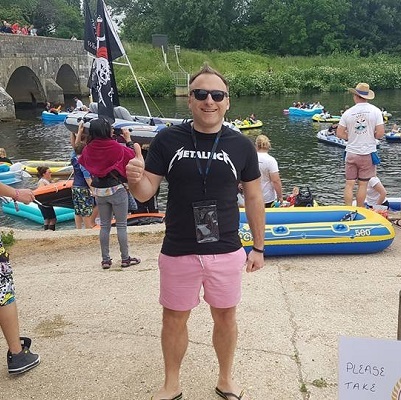 The people, the culture, the BBQ’s on the terrace and the awesome teambuilding activities like the time we went to the New Forest Water Park and had our very own Wipeout! I was born in Birmingham but emmigrated to South Africa when I was 3 and returned at 18. I joined Adido because of their expertise across the whole of the social media spectrum and my thirst to optimise social media to its fullest. What’s your favourite thing about Bournemouth? The summer time in Bournemouth – fish and chips at sandbanks beach watching the sunset. Tell us something about you that your colleagues don’t know yet! I love Megadeth and Metallica! What is your favourite tool to help with your job? Canva – Helps a mediocre graphic designer create some pretty cool engaging creatives. An NBA professional basketball player. St Lucia in the Caribbean. It’s relaxing, beautiful and so laid back with awesome street food. Tell us about a unique or quirky habit of yours. I don’t have any really, except I read a book a month on knowledge and self-improvement subjects. Seneca writings on The Shortness Of Life. I recommend you look it up, it begins “It’s not that we have a short time to live…”. When you walk into a supermarket you look to your right. Supermarkets also put fruit/vegetables in the front of the store and put biscuits/sweets at the back. Subconsciously you think you have done a good thing by buying healthy which makes you more likely to buy naughty near the end. Facebook. It has 2 billion active users. 1 in 5 web pages viewed across the world is Facebook. How many e-mails are sitting in your inbox? Zero, I put them all in their specific campaign related folders. Your smile is your logo, your personality is your business card, how you leave others feeling after having an experience with you becomes your trademark. Facebook have recently made this interesting move to help improve the user experience on this social media platform. Find out more here! Are Facebook Page Likes Still Relevant? Since the algorithm change, or since Facebook was nerfed, it’s been harder and harder for Pages to reach their followers. Why? Learn how Instagram hacks can elevate your brand by creating a more engaging story experience.